Keep employees productive with the Boss Drafting Stool B1615-BE with 20" chrome foot ring. The pneumatic gas lift seat-height adjustment lets users alter the height of the stool from 26.5 to 31.5". 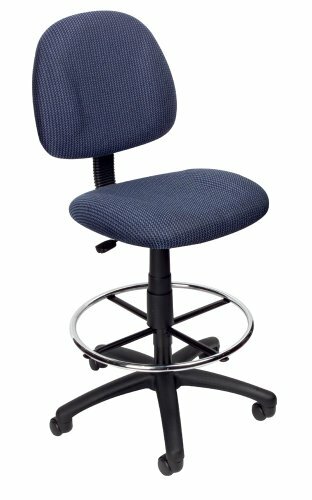 The ergonomically contoured seat, which is 17.5" W x 16.5" D, and back are upholstered in tweed fabric to withstand daily use, and the black 27" nylon base in a five-star format adds stability to the stool. Move the stool easily on hooded double-wheel casters. Weight capacity is 250 pounds and the overall size is 17.5" W x 25" D x 44.5 to 49.5" H.